I did this quickie project the other day while taking advantage of enjoying my Mom being here for a visit! It was super fast-about a half hour start to finish. I had previously mentioned that I painted the dining room table. Well, honestly folks, I’m still not loving it. I thought I’d experiement on the chairs a little to see if I could find something I’d like. 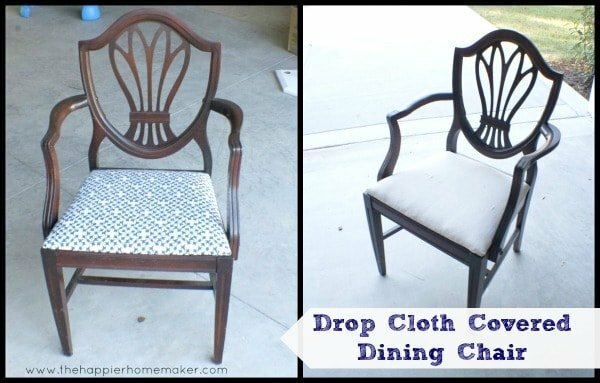 I found some drop cloth left over from my laundry room sink skirts and decided to recover one of the dining chairs with it. We bought this dining set in 2008 at an antique shop in Florida-it was the table, 8 chairs, a server, and the custom pads for the table. When we bought the chairs the seats were a dingy 70’s fabric so I recovered it in this blue and white patterned fabric shortly after we bought it. I liked it for a while but I needed a change, hence the drop cloth. Only one of the dining chairs had arms (which makes it the “fancy” chair in my mind), so I decided to try that one. First I unscrewed the seat from the chair base. So what do you think? 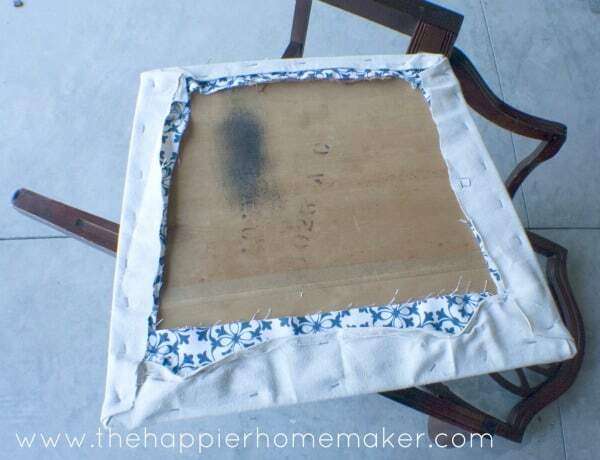 Better with drop cloth? Should I paint the chairs like I did the table? Anyone have ideas? I like the dropcloth. Don’t get rid of the set – I got rid of mine and I have regretted it ever since. .. I love it! My mom and I redid ours with some faux leather-looking vinyl, and I love them! They are SOOO easy to clean. Never thought of using a drop cloth, but it turned out great!! Oh no, why aren’t you loving the table? I love it! 🙂 and I think the chairs recovered will make a difference. need a picture of it all together – but yes, wondering if the chairs should go black like the table. 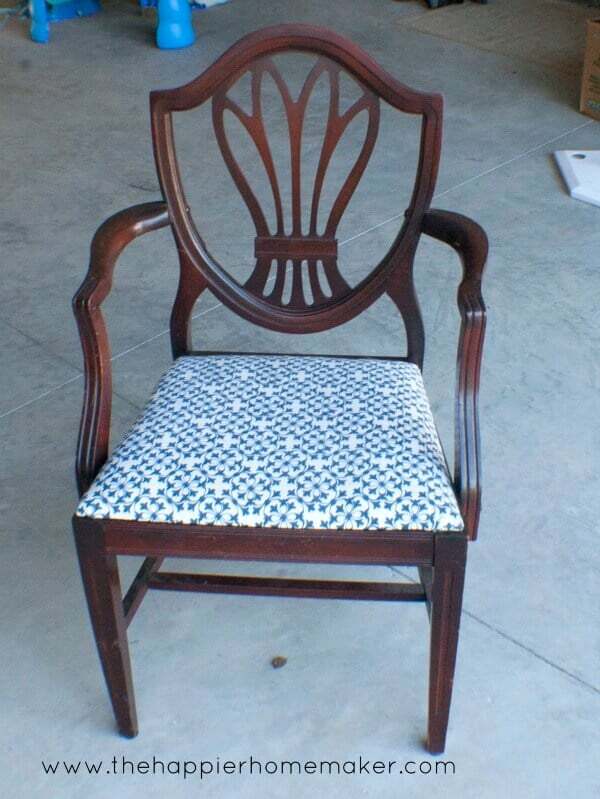 Beautiful job on your chairs – gotta love the quick with the fantastic result projects! Dropcloths are so versatile! 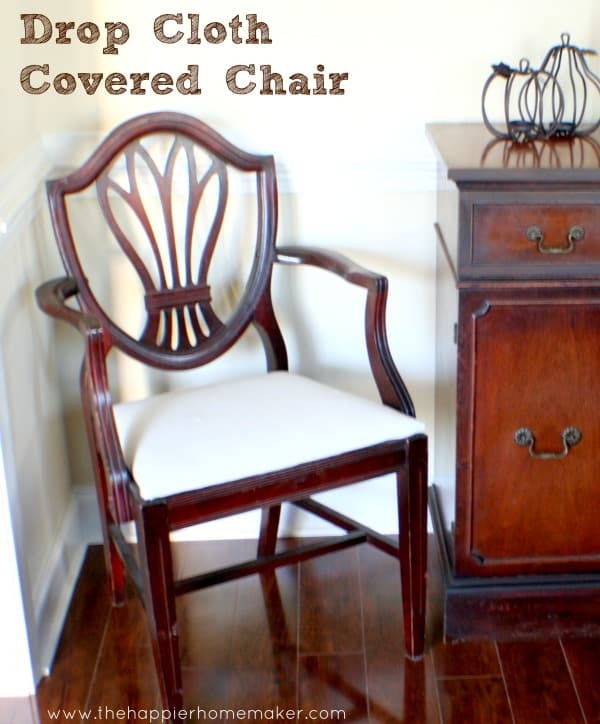 Love how easy peasy it was to make that chair fresh and new!! Not sure what look you are going for, but I have seen this style of chair repainted in a bold color and I absolutely love it! Or a bright fresh white! 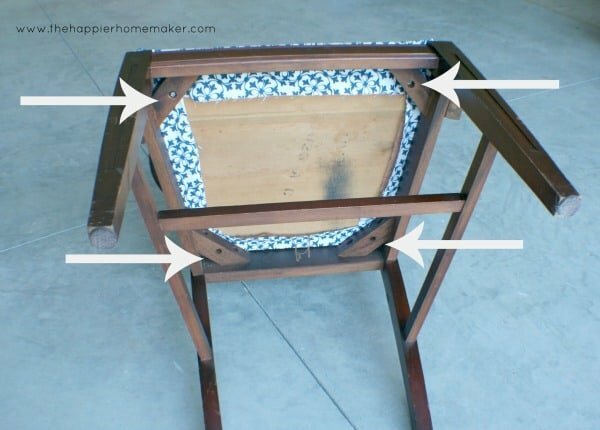 I have been planning to take on this exact project for a friend. Is there a specific weight of drop cloth I should look for or is it just a standard weight. Thanks.